^ 华夏足球. 官宣：卡塔尔世界杯将于2022年11月21日-12月18日举行. 搜狐体育. 2018-07-14 [2018-07-24]. ^ Emir Qatar Beri Selamat kepada Rusia. 共和报（英语：Republika (Indonesian newspaper)）. 2018-07-16 [2018-11-25]. 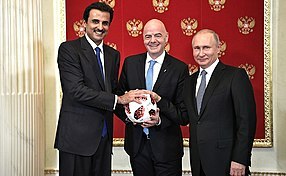 Presiden Rusia Vladimir Putin (kanan), Presiden FIFA Gianni Infantino (tengah) dan Emir Qatar, Sheikh Tamim bin Hamad al-Thani berfoto dalam pertemuan di Kremlin, Moskow, Rusia, Ahad (15/7). ^ Goff, Steve. Future World Cups. 华盛顿邮报. 2009-01-16 [2009-01-16]. ^ 2018和2022世界杯赛申办已达11国 2010公布获选者. 新浪体育. 2009-02-04 [2018-07-22]. ^ 2018 and 2022 FIFA World Cup bids begin in January 2009. [2009-09-29]. （原始内容存档于2012-12-11）. ^ World Cup 2018. 2015-01-05. （原始内容存档于2014-08-19）. ^ Indonesia's bid to host the 2022 World Cup bid ends. BBC体育. 2010-03-19 [2010-03-19]. （原始内容存档于2010-03-20）. ^ 图文：2018：俄罗斯 2022：卡塔尔 中国无缘2026. 网易新闻. 2010-12-03 [2018-07-23]. ^ Qatar world cup part of FIFA corruption scandal. 2015-06-07 [2015-06-07]. ^ Doyle, Paul; Busfield, Steve. World Cup 2018 and 2022 decision day – live!. 卫报 (伦敦). 2010-12-02. ^ Ferdinand Bada. Where Will The 2022 FIFA World Cup Be Held?. worldatlas. 2018-06-15 [2018-07-22]. Despite all this, this selection allowed Qatar to dethrone Switzerland as the smallest state to have ever hosted the FIFA World Cup. ^ Palmer, Dan. Hosts Qatar to compete in qualifying for 2022 World Cup. insidethegames.biz (Dunsar Media Company). 2017-07-31 [2017-08-15]. ^ Current allocation of FIFA World Cup™ confederation slots maintained. FIFA. 2015-05-30 [2018-11-26]. ^ INTERNATIONAL MATCH CALENDAR 2018–2024 (PDF). FIFA.com. 2015-10-06 [2017-02-22]. ^ 不卖！2022世界杯期间将全面禁酒 让你们再喝酒闹事. 凤凰网. 2016-11-11 [2018-07-21]. ^ 卡塔尔松口了 2022年世界杯球迷可以喝酒！地点：一小时车程外的沙漠里. 新浪新闻. 2017-12-27 [2018-07-21]. ^ Tamara Walid. Qatar would 'welcome' Israel in 2022. Thenational.ae. [2018-08-07]. ^ World Cup – Qatar 2022 green lights Israel, booze. Yahoo! Eurosport UK. 2009-11-10 [2018-08-07]. ^ Qatar to allow Israel, alcohol at World Cup. 科威特时报（英语：Kuwait Times）. 2009-11-11 [2018-08-07]. （原始内容存档于2011-06-17）. ^ Robson, Douglas. Peer wins history-making match at Qatar tourney. 今日美国. 2008-02-19. ^ Gezachw Yossef Biography. iaaf.org. [2018-08-07]. ^ Bidding Nation Qatar 2022 – Stadiums. Qatar2022bid.com. [2019-02-11]. （原始内容存档于2010-05-03）. ^ Late-November/late-December proposed for the 2022 FIFA World Cup. FIFA. 2015-02-24. ^ Qatar 2022 World Cup: Final confirmed as 18 December. BBC新闻. 2015-03-19 [2015-03-20]. ^ 米希尔·鲍斯. 卡塔尔外籍劳工月工资不足人民币2000元. 网易体育. 2013-12-29 [2018-07-24]. ^ Pete Pattisson. Revealed: Qatar's World Cup 'slaves'. 卫报. 2013-09-25 [2018-07-24]. ^ “世界杯”奴隶. 凤凰网. 2013-10-06 [2018-07-24]. ^ TingS／祖巴拉的珍珠. “世界杯奴隶”，可能赔上至少 4,000 条生命的炼狱. Yahoo奇摩. 2018-06-26 [2018-07-24]. ^ 卡法拉制度作怪 卡塔尔世界杯 外劳噩梦！. 网易体育. 2014-01-28 [2018-07-24]. ^ Qatar 2022: 'Forced labour' at World Cup stadium. BBC. 2016-03-31 [2018-07-24]. ^ 卡塔尔劳工待遇“震惊”世界杯组织者. BBC. 2013-09-26 [2018-07-24]. ^ Qatar World Cup construction 'will leave 4,000 migrant workers dead'. theguardian.com. 2013-09-26. ^ 《卡塔尔门》引足坛轩然大波 抽丝剥茧真相还原. 搜狐体育. 2013-02-01 [2018-07-23]. ^ 法媒曝卡塔尔贿赂FIFA高层内幕 法前总统曾助力. 凤凰网. 2013-01-30 [2018-07-23]. ^ Plot to buy the World Cup. 星期日泰晤士报. 2014-06-01. ^ FIFA and adidas extend partnership until 2030. FIFA. 2013-11-21 [2017-05-10]. （原始内容存档于2017-06-28）. ^ Matthews, Sam. Coca-Cola renews Fifa football sponsorship until 2022. Campaign. 2005-11-22 [2017-05-10]. （原始内容存档于2017-08-27）. ^ Hyundai-Kia drives on as FIFA Partner until 2022. FIFA. 2010-11-24 [2017-05-10]. （原始内容存档于2017-06-18）. ^ Qatar Airways announced as Official Partner and Official Airline of FIFA until 2022. FIFA. 2017-05-07 [2017-05-10]. （原始内容存档于2017-05-11）. ^ Mickle, Tripp. Visa extending World Cup deal for eight years. 体育商业日报. 2013-04-01 [2017-05-10]. （原始内容存档于2017-08-27）. ^ Wilson, Bill. Fifa signs China's Wanda as partner. BBC新闻. 2016-03-18 [2018-12-06] （英国英语）. ^ FIFA and Anheuser-Busch InBev announce FIFA World Cup sponsorship for 2018 / 2022. FIFA. 2011-10-25 [2017-05-10]. （原始内容存档于2017-08-27）. ^ Carp, Sam. Fifa agrees massive World Cup deal with Vivo. SportsPro. 2017-05-31 [2017-05-31]. （原始内容存档于2017-06-02）.